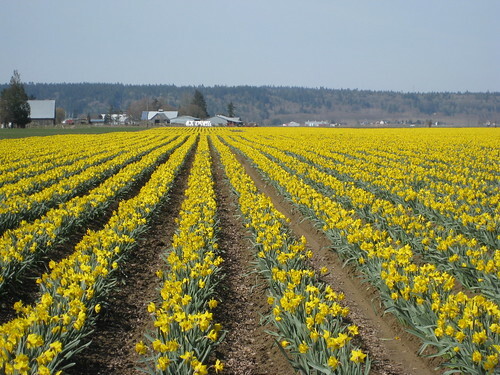 A daffodil field in Skagit Valley outside of La Conner. Photo by flickr user brewbooks. Looking for a little more color in your life? This is the month that the Skagit Valley fills with beautiful flowers. La Conner and the surrounding fields are known for the Tulip Festival, which officially takes place for the whole month of April. But the weather and the flowers don’t always cooperate. So, if you can’t wait for the tulips (which should bloom any day now) head down to La Conner and check out the daffodils. Nothing like a field of yellow flowers to brighten a gray day. UPDATE: The tulips are out in force! I haven’t gotten to write about/ photograph them, but check out the lovely post on Jolene’s Life in Focus blog! You might notice me blogging a bit more about La Conner. 45 minutes south of Bellingham, this small artsy town is where I grew up. I’ve been spending a lot of time there lately prepping a house for sale. I hope I inspire some of you to go down and check it out!